The jaded couple will learn…there is no escaping from the longings of the heart. The Duke of Eversley swore never to love again after the tragic death of his first wife Blanche, and he is still haunted by her memory. Still The Duke’s recent attention to The Mad Heiress, Miss Georgette Quinby, has set the Ton awhirl with gossip. 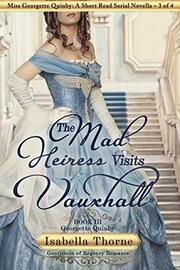 The Mad Heiress has been plagued by scandal for nearly a decade and is certainly not fit company for a duke. However, Miss Quinby’s acquaintance with The Duke is more than a simple romance. Unbeknownst the Ton, Miss Quinby has been helping Eversley to catch a spy working against their beloved England. Eversley finds himself drawn to the passionate Miss Quinby, but it has been unfair to her lead on. The Duke has always been a devoted man. Devoted first to his late wife and then to his duty to his country. 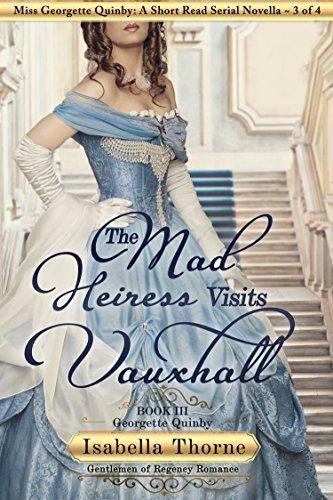 The Duke cannot possibly be courting the Mad Heiress; he has a spy to catch. She must find a way to warn The Duke…before it’s too late.